How do you take something simple and cheap, and turn it into an expensive ordeal? 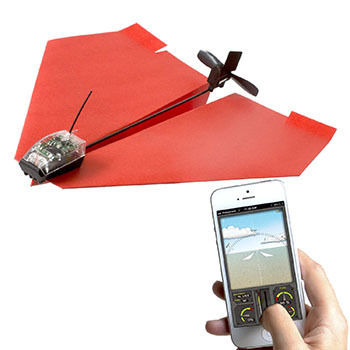 In 2014, the answer is “Bluetooth it to your phone!” With the $49.99 PowerUp Smartphone Controlled Paper Airplane, you can do this very thing. The world of paper airplanes could be an enjoyable, inexpensive way to spend time with your kids, friends, or coworkers, but why risk the chance of shared emotion or eye contact? Keep your looky-orbs glued to your phone, and replace the graceful arc of a well-folded paper glider with the buzzing gigahertz transmission of a smartphone-controlled trinket.